I’m a tad bit obsessed with all things peppermint, and I made some darling Peppermint Striped Candlesticks that are perfect for your Christmas decor! I really love the striped and polka dot pumpkins I made this fall, and I thought the stripes would be perfect for the peppermint theme, and to add to my Christmas decor. I was right! I’m in LOVE with the red & white peppermint stripes! I made a set of three–a stripe, a plain white, and a plain red. I also made them into candlesticks, by drilling a space for tea lights. I love how quick and easy these are to make–they were done in an afternoon, and that includes drying time! I used the same technique to make the stripes as I did with the pumpkins! For the plain pumpkins, I like having the colors layered, so I painted the white post red first, then white, so when I sanded and distressed it, it would be white with red peeking through. I did the opposite for the red post. I also painted the entire striped post red first, then added the tape for the stripes and painted white on top. After the paint was dry, I used a sander to distress each piece. I used a 1 1/2 inch spade bit (you can get them for as low as $6 as Home Depot) on my drill to create the opening for the tea lights. Sometimes a spade bit can be a bit tricky at that size–I used it because I had it–but a Forstner bit’s blade is designed a bit differently. I have these on my kitchen table and LOVE them! They would be darling for party centerpieces, and can be used indoors safely if you use battery operated tea lights. They would also look cute on a mantel, entry table, window ledge, and probably anyplace. ☺ I’m crazy about stripes, admittedly!!! 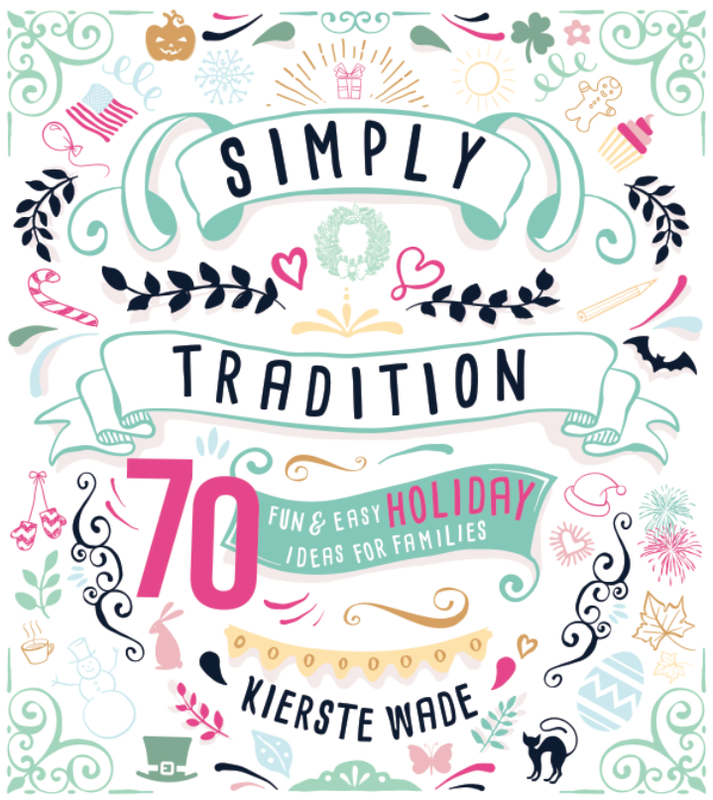 Don’t forget to check out my new book, Simply Tradition: 70 Fun & Easy Holiday Ideas for Families. It’s chock full of holiday traditions, ideas, and recipes for every family–and it makes a great gift! And don’t miss a thing…sign up to get Simply Kierste in your inbox, and I’ll send you some darling, exclusive printables. Just enter your email address in the box below! These are so cute and clever! Pinning! Totally in love with these!! Pinned and shared on Facebook! Seriously the cutest, girl!! Love these! I absolutely LOVE these Kierste. They are adorable!! These are awesome, Kierste! I love it. Pinned! Hi Kierste,these are really the BomB!! so cute I love your work all ways amazing….Thank Merry Christmas…. Such a great idea, I absolutely love these! Thank you so much, Shelly!!! Merry Christmas!! Super cute!! I’m in love with the stripes! Thank you, Ingrid! I’m in love with stripes too! These are super cute, thanks for sharing your fun idea! You are so welcome! Thanks for stopping by!! That would be adorable too!! Send me a pic if you do!! These are really cute. What kind of spray paint did you use and how did you distress them? Could you use acrylic paint? Can you do the distressing with sand paper or do you need a power sander? Did you put some kind of finish on them after all was done? Would you be able to use normal tlights or just the battery ones. I just used the battery-operated ones, so I could use them safely in the house, and not worry about fire. These are so darling they’ve inspired a girls night craft night with my besties!!! Thank you for sharing your creativity! 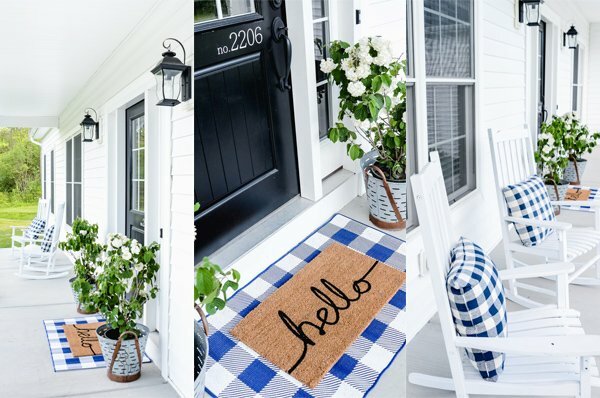 These are the perfect craft night project! Have SO much fun with your besties! Could I use acrylic paint on these? I am making them this week yay! Yes, you can! You will probably need more than one coat for good coverage, so plan accordingly, but it will work! Have so much fun!!! I love all your crafts! I’ve made the 4×4 pumpkins and now I’m about to finish these peppermint candle sticks! I can’t wait for the 4th of July flag 4×4’s! They are all super easy and super cute! Thanks Kierste! Hi, Sherri! I used a router to take out the circle on the top–I explain more about it in the post! Could you please tell me what kind of wood your posts were that you used. Thanks so much, love your stuff! I’m making these today with 25 friends! Can’t wait to share the photos with you! Oh my goodness, how fun!!! Can’t wait to see them! These are so darling! I made the pumpkins with some friends this fall. We loved them so much, we are making these! Just a question. Could we use acrylic paint instead? I’m worried it is to cold for spray paint. Thanks! Yes, you can definitely use acrylic paint! You may need an extra coat, so plan accordingly, but it will totally work. Enjoy!! These are adorable, have been looking for some stylish but easy to make Christmas decorations and these are perfect! Love these! Making them tomorrow for my daughter for Christmas! Can you tell me the names of the fonts you used for “peppermint Striped Candlesticks” please? Beautiful! I’m making these for my Ward Christmas Party Centerpieces!! So excited!! Did you use paint or spray paint? Oooopss…I just ready the comments and there is the answer! Thanks Kierste! Having lots of trouble trying to make the candle hole in the top. Looks all chewed up and not smooth like photo. Any tips? Sometimes a spade bit in this size can be a little tricky. You can also try a Forstner bit (amazon affiliate link: http://amzn.to/2yHKdjy, and you could try Home Depot too), the design of the blade is different and thus should remedy the issue. Good luck!!! Bleed through so the lines are not perfectly straight. Then I sanded with a sanding block but it didn’t give enough of a rustic effect so then I did a sanding belt but not they look too warn out lol. Sure! Send me a photo to simplykierste@yahoo.com!